As a family, we have far too much meat, so it is quite nice to have vegetarian meals once in a while. At the moment, we are doing the Orthodox Lent until the Greek Easter on 5th May so we are having a little break from meat/poultry for 7 weeks. Since we are not having meat, we are replacing our protein with eggs and creating some lovely family meals. 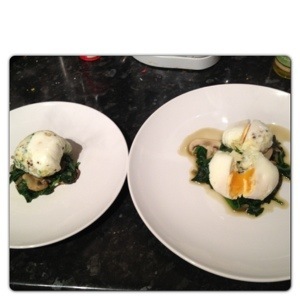 One of those is: Flavoured Poached Egg with Spinach and Mushroom. Although it looks sophisticated, it is extremely easy to make, so it is perfect as a weekday meal. Bring a medium saucepan of water to the boil. Line a small bowl with a layer of cling film, make sure there is enough cling film all around the sides of the bowl. Crack the egg into the bowl, add a pinch of finely sliced onions and herbs, salt and pepper. Gently mix the seasoning in the egg white, being careful to keep the egg yolk intact. Seal tightly, I found easier to use a tie from a freezer bag. Cook gently for around 5 minutes, depending on how you like your eggs cooked. Heat one tablespoon of olive oil in a large, heavy based saucepan and add the finely sliced onion. Fry over gentle heat for 2-3 minutes, until softened. Add the sliced mushrooms and sauté for another 2 minutes. 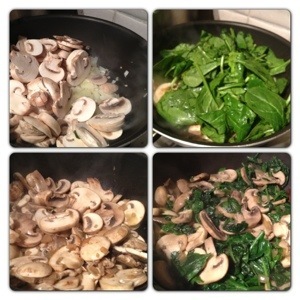 Once the mushroom is cooked, add handfuls of spinach and cook it until just wilted. Add more spinach little by little, until all the spinach has been used. By the time the vegetables are cooked, the eggs should be ready. Carefully remove the egg parcel from the pan and gently open the cling film to remove the egg from it. 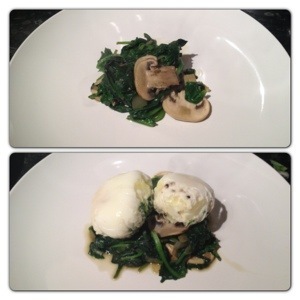 Place some spinach and mushroom on a plate and top with the flavoured poached egg. Enjoy! I really like poached eggs, so by using cling film, it is an easier way to poach them and retain their shapes. You also have the option of adding herbs and seasoning of your choice. It is a very quick and practical dish, it was a success with the whole family. Children can have one egg each, while adults could have 1-2 eggs. 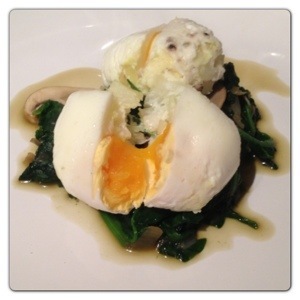 Flavoured Poached Egg with Spinach and Mushroom is very filling and full of flavour. It is a great option for a main meal just before food shopping when you are running out of ingredients. You could enjoy it with slices of crusty bread. Although it looks complicated, it is not. 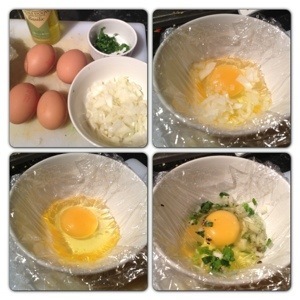 It is an easy dish to make, you could add different herbs and spices to flavour your poach egg according to your taste. 25 Responses to "Flavoured Poached Egg with Spinach and Mushroom Recipe"
What a great way to poach eggs, I always fail miserably putting them straight into water. Another great recipe thank you! i never thought about poaching an egg in cling film! i just let it loose in the water and it makes a right old mess, i know what im having for breakfast! Knockout recipe – I’m a big fan of spinach because of it’s health benefits and I’m always looking for new ideas for cooking with it. I do love a poached egg but I never get them right! I have never thought of poaching eggs this way but it looks like a great way to do it, and the recipe sounds really tasty. 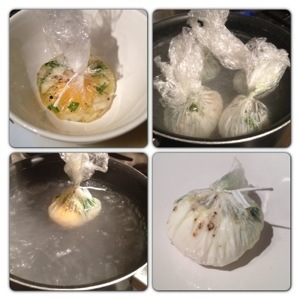 Great way to poach eggs, thanks for the tip. Fab recipe, I especially liked the way you seasoned and poached your egg – good idea!